At first it was difficult to find a groomer for Barney as many have not had the privilege of grooming this wonderful breed. Barney's new groomer tells us that he is not too fond of his bath, but loves the dryer! Go figure! We were very pleased with the results. He is groomed every 6-8 weeks, and always seem to find a large mud puddle to romp through after his grooming. Fun times! Barney is adorable! I also like his ears. Barney is very handsome. I really like the colors on the ears. Barney is adorable. Our Molly gets a similar cut from her groomer every 3 months. Molly also has a way of finding the mud after we pay a fortune to the groomer for her cut and bath. Thank goodness for our utililty sink. My husband rigged up a shower massage to the faucet and we wash her feet and little legs between her baths. Join in and write your own page! It's easy to do. How? 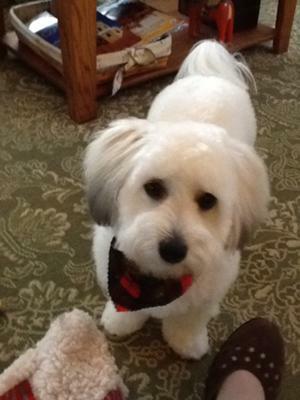 Simply click here to return to Coton de Tulear Puppy Cut Photos.